William Steig: father of texting? Millions of people are familiar with the acronyms used in texting every day. w@ (What?) you say? u r ok (You are okay.) ne1 ne sec (Anyone, any second) can see it’s a word puzzle where some are obvious, others not so much, or are acronyms as learned symbols. But texting isn’t as new as you might think. In 1968 CDB! 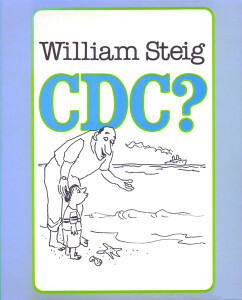 by the ever clever William Steig was published by Simon & Schuster and reissued later in color. The accompanying image on the cover of a little boy showing a little girl an insect on a flower is the tie-in for some of the trickier letter combinations. (See the bee!) She responds D B S A B-Z B. On another page the text says A P-N-E 4 U. I have peonies in my yard too and they make a beautiful gift. Hey, Steig is texting without a cellphone. Analog texting, I guess u could say. 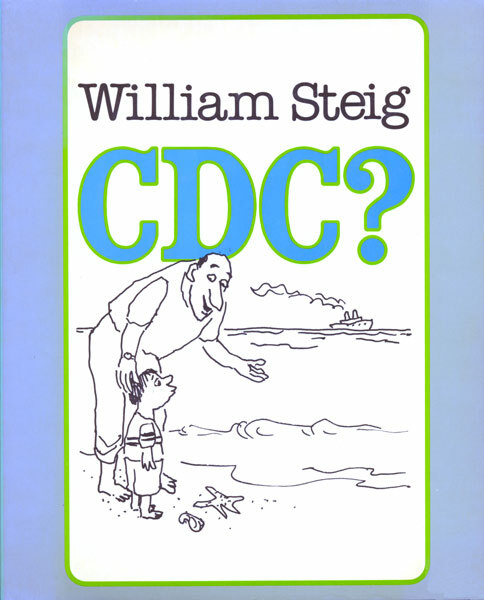 In 1984 Farrar, Strauss & Giroux published Stieg’s CDC? This sequel has such gems as this conversation – U F A 4-N X-N, 9? says the German to the Spaniard who responds, C,C! Or this – V F E-10 D L-F-N, accompanied by a group of well satisfied, smiling natives and some very large bones. If U do not get that, R U feeling N-C-Q-R? If U find them easy, as Steig says, U R N-2-8-F N Y-S! This entry was posted in children's books and tagged book art, children's books, letters as words, picture books, text, William Steig, wrod play. Bookmark the permalink. Post a comment or leave a trackback: Trackback URL.